If ten hours of iPad video, web browsing, and game-playing aren’t enough, and you’re willing to pay a premium, QuickerTek’s new Apple Juicz external battery for the iPad may be the thing for you. The company’s new external lithium-ion polymer battery advertises up to 20 hours of additional iPad use on a full charge, and offers an additional USB port for any other device needing a boost. Users can juice up the battery itself in just three hours with the iPad’s own wall charger, and check its status via built-in LED gauge. According to QuickerTek’s Website, you can look forward to a minimum of 2,000 recharges from the device—good to hear, considering the device’s half-an-iPad cost of $250. For some users, however, the price could easily be outweighed by the needs brought on by an extra-long car trip or marathon Netflix session. 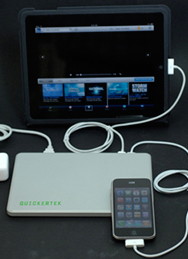 You can buy QuickerTek’s Apple Juicz external battery via the company’s Website.